I have always like Star Trek series so it's good too me. Could be interesting if the series wasn't so much like the last one (it will be no matter what to me anyways). Yes it is mixed up with the last one but the reality change brings so much change to the future I don't know. Weapons, armor, political power, sectors changes could occur, some wars could be over before they start, will the demeanor of the Federation change to a more aggressive nature. Like the title says "Into Darkness". What does the future hold, I don't know, we will just have to wait and see. Rebooting done the right way. 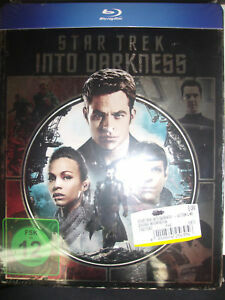 It has good action and drama in what you would expect out of star trek. It has many moments giving a throw back feel to you classic movies while even thou being a reboot movie keeping a good story to show its not really a reboot but a stand alone all its own. I guess in a way this is an unfair review, because I am a Star Trek fan, and love anything Star Trek. I do recommend this movie.. I am also a fan of TOS (The Original Series), TNG, DS9, and Enterprise. While I enjoyed Into Darkness and the plot. The Wrath of Khan, in my opinion, was the Best of All Star Trek Movies. Into Darkness was still however, a real good movie. Enjoyed the updated special effects of the movie, the surprise appearance of the Original Spock and the reverse rolls Kirk and Spock had in the death scene. I can’t wait for the next movie to come out. May Star Trek Live Long and Prosper!!! Great movie. Humorous, action packed, great comraderie amongst actors. Very exciting action scenes. Loved it!